Blackjack, the most popular casino game worldwide, has gathered its fair share of slang and jargon over the years. Recognising the most common phrases used at the table will make you a more knowledgeable online and brick & mortar player, and understanding each move can often be the difference between winning your hand or losing it. 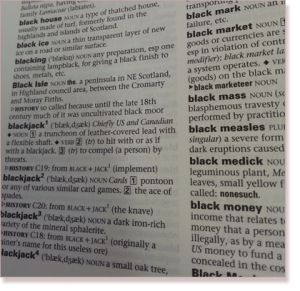 It is also important to understand the common terminology in blackjack so you know what the dealer and/or other players are talking about. We’ve compiled an easy-to-understand list of the most important terms in the game of 21, along with detailed examples so we can picture the scenarios. The Ace – essentially the best possible card you can be dealt in any game of blackjack. Without it, it is impossible to hit blackjack with your first two cards. The Ace has two values; one and 11, depending on how you wish to count it. If you are drawn a 10-valued card and an Ace, this is a natural blackjack (you count the Ace as 11 points). If you are dealt an Ace and a Six for example, you have an important choice to make: should you count your hand total as seven or 17? Your decision, which should be based on what the dealer is showing, will influence the outcome of your hand significantly. If we are dealt a pair of Aces (lucky us) on our initial two cards, they can and should always be split in to two separate hands to maximise our chances of hitting blackjack. Our bankroll refers to the amount of cash we are willing to play with at any casino game. While we may not always begin a blackjack bender with a specific amount of cash in mind that we are going to play with, doing so is recommended. If we have $200 we plan to use for our casino splurge, set aside a certain amount for blackjack, and that is now your bankroll for the game. A bust or break refers to a losing hand which exceeds 21 points. The bust card is the unlucky card dealt which pushes our hand’s total over 21. Any hand which reaches a total greater than 21 is an instant loss. If the dealer busts and you do not, you are paid out. If your hand contains a points total of 13 and you proceed to hit, but are dealt a Queen (valued at 10 points), you bust as your hand’s value is now 23. Note: In some versions of blackjack, if the dealer reaches 22, instead of them busting, it is a stand-off (no one wins or loses). This is close to straight thievery, and although such games usually hold a rule where players are paid out immediately upon hitting blackjack, regardless of the dealer outcome (namely Blackjack Plus at Crown), they should be avoided. Doubling down or simply doubling is the option we have to double our original wager after examining our current hand, and in return receive only one additional card to be dealt. For example, if we have a hand valued at 10 points with an original stake of $10, we can (in most games) choose to double and place another $10 on our hand. We will now be dealt one more card, and one card only. Let’s say we are dealt a Jack; we now have 20 points and should probably stay. If we win the bet, we receive a payout of $40 (our initial $20 returned, plus a $20 profit on top of that). Hands totalling nine to 11 points are considered the best hands to double down on. Some BJ versions allow us to double whenever, while others only allow us to double when we have a total of nine, 10 or 11. Face cards refer to all the cards with a face (Jacks, Queens and Kings) in any standard deck. In blackjack, face cards make up just over 23% of the cards in one deck (12 face cards in a standard 52-card deck). They are valued at 10 points each and are highly favourable in any game of 21. Face-down blackjack is the version of 21 where everyone’s cards are dealt face down. Players are prevented from examining the dealer’s cards until all other cards have been dealt. This style of play makes it more difficult for the player given he/she is unaware of what cards the dealer (and fellow players) are holding. Face-up blackjack, also known as Double Exposure, is the version of 21 where all player and dealer cards are dealt face up. This version grants all players the ability to examine cards and their respective values throughout the game, and base future moves on what is observed. While this makes decisions easier for the players, rules are altered to even out the game. A five-card-Charlie is the name given in blackjack when we are dealt a five-card hand without going over 21 (without busting). In some styles of blackjack, we are immediately paid out at 1:1 odds if we secure a five-card-Charlie, irrespective of what the dealer has. On average, such a hand occurs once in every 50 hands. A six, seven, eight, nine and 10-card-Charlie are a heap more rare. A hand refers to the cards the player or dealer is holding. There are different types of hands, such as hard and soft hands (get your mind out of the gutter), which have their own specific strategic values attached to them (as explained in detail below). A hard hand, also known as a stiff hand, refers to any hand without an Ace and with a value of 12 or more, or a hand with an Ace forced to be valued at one in order to avoid a bust. For example, a hand which comprises the following cards is considered to be hard: a Five, Eight and an Ace (totalling 14). The name derives from the difficulty of playing out and winning such a hand. It is always the case with a hard hand where drawing one additional card can force you to bust. A hard-17 hand refers to a hand which includes a Seven, Nine and an Ace, forcing 17 as the total value of the hand. The Ace must count as one point in order to avoid exceeding 21. To hit, also known as drawing, is when you ask to receive another card, often signalled with a knock on the table if playing at a land-based casino. You are increasing the value of your hand with an additional card when you choose to hit. If you hold a Seven and a Nine (a total of 16) and opt to hit, you better pray to be dealt a card lower than Six in order to avoid busting. In face down games, you signal a hit by sliding your cards back and forth across the table. In hole card games, the dealer receives a first card face up, and then after dealing to all other players, receives a second card, referred to as the hole card, face down. The dealer may or may not peek at this card; if peeking, it is to check if he/she has blackjack. The hole card is not revealed until players have finished their turns (unless, if it was peeked at, it has given the dealer blackjack, and then it is revealed). In European versions of 21, hole cards do not come in to play because the dealer’s second card is not drawn until all players have played out their hands. The house is the entity which sets the rules and controls the play of 21 (and other casino games), and the house edge is the advantage the casino holds (usually noted as a percentage) over a player in any game. Insurance is a common blackjack side bet where a player can insure his hand against the dealer hitting blackjack. This bet is treated as independent of the main bet. If the dealer’s first card is an Ace, hitting a card valued at 10 on the next draw is relatively likely (just shy of 33%), so most games will offer the insurance option to the player, available before the dealer checks or draws the hole card. This type of insurance is for players not holding a natural blackjack, and a wager of up to half of their initial stake is required. If the dealer does hit blackjack, you are paid out at odds of 2:1, thus covering your loses. Maximum insurance is offered for players who are holding a natural two-card blackjack, and wish to fully insure their hand against a potential dealer blackjack. Here, the player need not put forward any additional bets; they are simply forfeiting the 3:2 payout they would receive if they won their hand, and committing themselves to taking an even money payout (1:1), paid out immediately, regardless of what the dealer ends with. 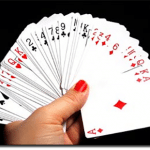 A natural hand refers to the two-card hand totalling 21 points, otherwise known as blackjack. A 10 and an Ace, a Jack and an Ace, a Queen and an Ace or a King and an Ace are the four examples of a natural hand. A push, also known as a stand-off or tie, is when the player and dealer have hands with the same total, leading to a result where no-one wins or loses and the player’s wager is returned without any profit. The shoe is the gaming device used by dealers to hold multiple decks of playing cards. It holds all of the cards to be used in the coming games and helps to make it difficult to count cards. A soft hand refers to any hand which contains an Ace and can be valued at either one or 11 points. You cannot bust with one additional card when you possess a soft hand. In such a situation, you have a good opportunity to improve your hand if the dealer catches a bad card. For example, if you have an Ace and a Five, you can count your hand as either six or 16 and have no risk of busting if you opt to hit or double down. A soft-17 refers to a hand which includes an an Ace and any other combination of cards totalling six. For example, an Ace and a Six, or an Ace, Four and Deuce. The Ace card can be valued at one or 11 and you are in a strong position. Like any other soft hand, you cannot bust on the very next card you draw. In all games, there are rules stipulating whether the dealer must stand or hit on a soft-17. If the dealer is required to stand on a soft-17 hand, then this benefits the players, as doing so decreases the house edge by about 0.2%. A split or splitting refers to the play option of being able to divide our hand into two separate hands, with an equal bet amount for both. Splitting is only available when you are dealt your first two cards and they are of the same value. If we decide to separate the cards to make two individual hands, we need to lay down an additional bet equal to our original wager to cover the second hand. The dealer will proceed to draw an additional card for each new hand. We then play out both hands in turn. There are several variances in the rules regarding splitting hands which all depend on the style of 21 we are playing, but there is always a level of restriction to limit or balance the tactic. Whether we can split any two cards worth the same value (King and Jack, Ten and Queen) or if we can only split matching cards (King and King) varies from game to game. Another rule dependant on the blackjack version is the continual splitting option, where if we receive two of the same cards and opt to split them, and then receive another card of the same value, we may or may not be able to split again (and again). Standing is when we choose to stop being dealt additional cards, and keep our current hand’s total. For totals of 18 and above, it is recommended to stand in most scenarios. When playing at land-based casinos, standing is signalled by waving your hands over your cards to indicate you want no further cards dealt. In face down games, you signal a stand by sliding your cards under your existing bet. 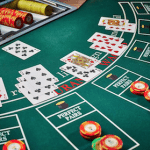 Surrendering refers to the offer in many blackjack games which allows players to give up their hand in the current round and retrieve half of their wager. Surrendering is a viable tactical option if you have a hard hand and find yourself in an unfavourable position. For example, if you are holding an Eight and a Seven and the dealer has an Ace, surrendering to retrieve half your wager instead of quite possibly losing it all may be beneficial. Obviously you don’t want to get in a habit where you are surrendering on a consistent basis. Surrendering should try to be avoided and only considered once you have thoroughly gone through every other option available. The up-card in any face-up game of 21 refers to the dealer’s first card which has been dealt. It is always available for the players to view and subsequently examine their own playing options.